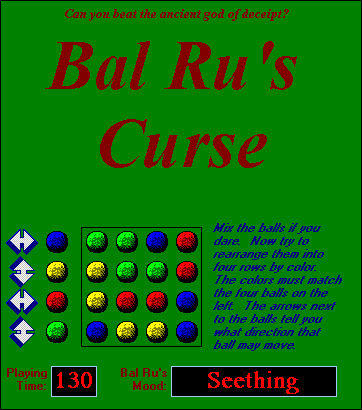 Bal Ru’s Curse could be one of the all-time most spiteful games. The game’s backstory explains that Bal Ru, the god of deceit, was imprisoned in a mysterious puzzle and uses his now-limited powers exclusively to screw over people trying to play it. Thanks to Bal Ru, his accursed game is nearly unsolvable – and not much more enjoyable. But Bal Ru watches over the game, looking for opportunities to torment you. Every so often, randomly, Bal Ru will rearrange the board and swap the directions balls can move. This trickery happens frequently as Bal Ru’s mood worsens from “Amused” to “Peeved” to “Angry,” sometimes as quickly as thirty seconds apart. The ball-switching puzzle is intriguing enough without Bal Ru’s interference. With the added twist, the game regularly resets and is almost unplayable. You essentially need to complete Bal Ru’s Curse within a minute or less, which is absurd. 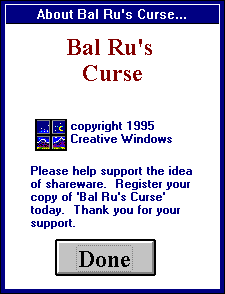 Bal Ru’s Curse needs less Bal Ru. His nastiness disrupts the game probably more than intended and would fit better if less severe. UPDATE: If you’d like to try this concept with the bad parts cut out, reader CHz made a “cruelty-free demake” using PuzzleScript that distills the game to the ball puzzle. It’s easier than expected without the external pressure but still interesting to solve. Maybe a sliver of Bal Ru’s magic would help. Thanks CHz!